Prominent & Leading Manufacturer from Bengaluru, we offer 2 burner glass cook top stove, 3 burner glass cooktop, 4 burner glass cooktop, 2 burner designer cooktop, 3 burner designer cooktop and 2 burner stainless steel lpg stove. Catering to the diverse demands of our clients, our organization is offering a quality range of 2 Burner Designer Cooktop. The given product is demanded due to its elegant and attractive designs and can be availed in both designer and black glass. It is carefully fabricated using superior grade material to ensure its durability. 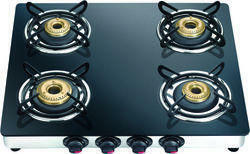 Looking for “Glass Cooktop & LPG Stove”?